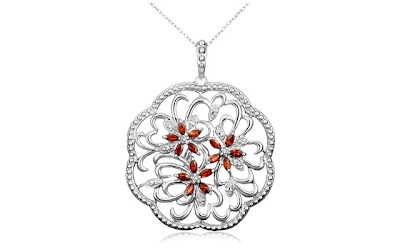 The Platinum Plated Sterling Silver Garnet and Diamond Accent Flowers Pendant 18" Necklace is currently selling for just $79.00 on Amazon.com! You will be saving 72% off the listed price of $284.99 with this jewelry deal. What I like about this floral necklace is the round shape of the pendant. This prominent necklace, with a pendant measuring 1.95" tall, will make quite a bold statement.